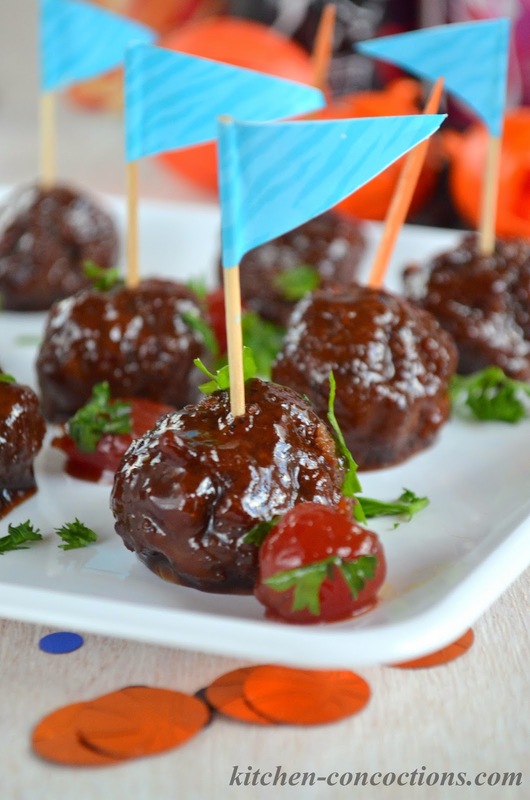 These sweet and spicy Chipotle Cherry Coke Glazed Cocktail Meatballs are perfect for watching sports with friends or even a as a quick weeknight meal. Let’s talk sports! This is kind of a comical statement in our house because we really aren’t sports people. Sure we enjoy going to a handful of sporting events a year and can follow along enough to carry on a conversations with the general population, but we are definitely not sports fanatics. With that said, we eagerly anticipate all the big sporting events every year. We enjoy the opportunity to get together with friends and family, and get excited to watch and eagerly cheer! This is no exception when March rolls around. We enthusiastically fill out our “brackets” not necessarily based on the team’s scoring history or beloved point guard, but based on the teams’ mascot, or the school colors, or the city and/or state the school is from, or if ever at any point of my life I ever had a friend or acquaintance go to that school. I know so technical, but hey, in all these years it has served me well! LOL! In addition to carefully and meticulously filling out our brackets during the month of March, we love watching a few of the games, and we like bonding with friends over some delicious game day eats! Ahh… yes you knew it was coming! I, of course, had to take all this sports talk and bring it right back to food! I mean this is a food blog… right?!? So of course! 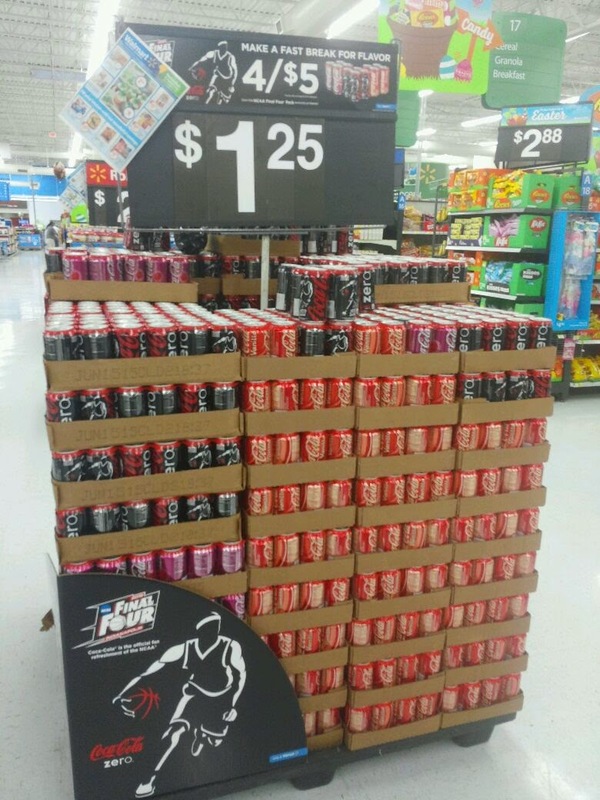 Recently, while in the midst of bracket forms and cuddly, I mean fierce, mascots; I saw this special display of Coca-Cola NCAA® Final Four Packs (available at Walmart). 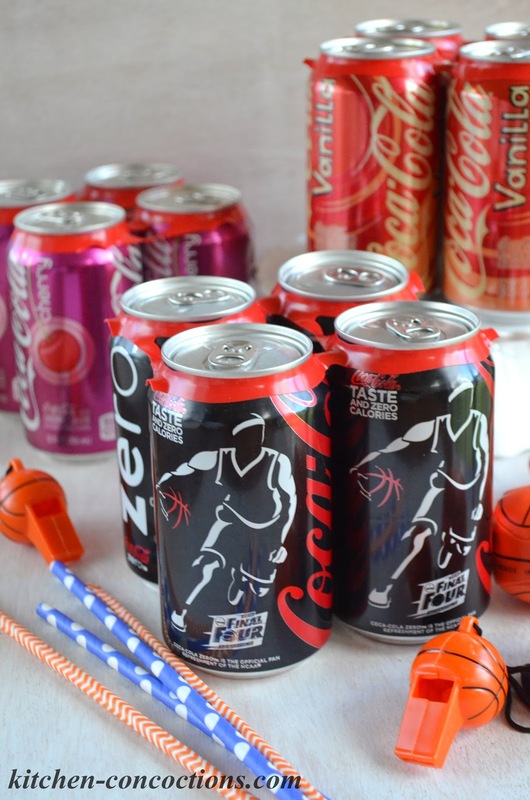 Not only would these Coca-Cola NCAA® Final Four Packs (available at Walmart), in Vanilla Coke, Cherry Coke and Coke Zero, be fun and festive for serving at NCAA® March Madness party, I knew I had to use them to come up with a special NCAA® March Madness party recipe! While a lot of people have their favorite party recipes, especially for watching sports, my favorite are those glazed cocktail meatballs, despite them lacking any photogenic ability, lol! I have several versions cocktail meatballs here on Kitchen Concoctions, since they are always a hit at parties, but this one just might be my favorite! If you are making these for a crowd, you could certainly double the glaze and use store bought frozen meatballs, but let me tell you, it just won’t be the same. The spices in these homemade meatballs, paired with the sweet, spicy and smokey glaze make for perfect, dare I say it, winning meatballs! So here’s to everyone who is watching, that their special team (however it was decided) wins! I’ve shared my NCAA® March Madness traditions with you and I’d love to hear about yours! Share your scientific way for filling out your brackets, your favorite game day recipe or traditions in the comments below! Spicy homemade meatballs with a sweet and spicy chipotle cherry Coke glaze. In a large bowl combine all ingredients for meatballs, except for canola oil. Mix meatball mixture until well combined. Using a cookie scoop or tablespoon, shape ground meat mixture into meatballs. Place formed meatballs on a baking sheet or plate and set aside. Meanwhile, heat canola oil in a large skillet over medium high heat. Working in batches, brown meatballs, cooking for 2-3 minutes on each side. Remove cooked meatballs from pan and drain on a paper towel lined plate. Repeat with remaining meatballs until all are meatballs are cooked. 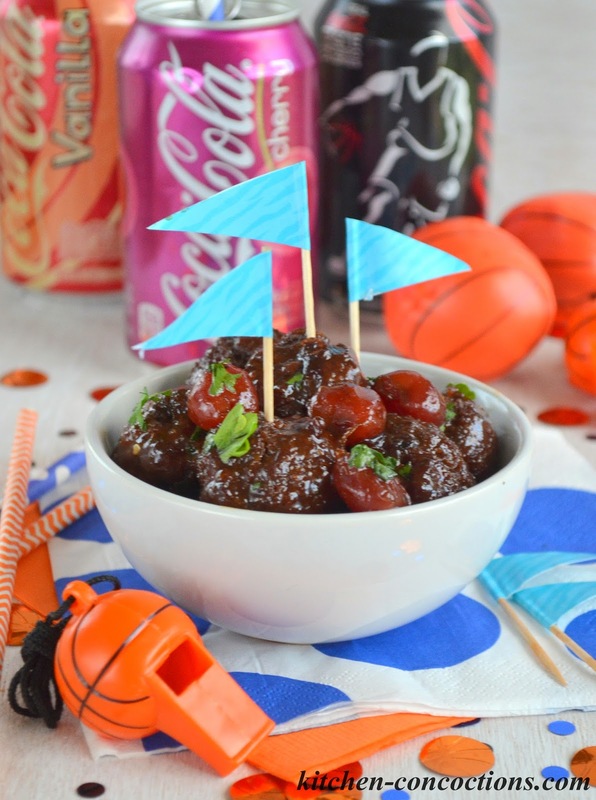 While meatballs are cooking, prepare Chipotle Cherry Coke Glaze by whisking all ingredients together in a small bowl. Set aside. After browning all meatballs, place meatballs in a large pot. Cover with prepared Chipotle Cherry Coke Glaze. Bring to a boil, and then reduce heat to a simmer. Simmer for 20 minutes, or until meatballs are cooked through and sauce is thickened. Serve immediately with cocktail toothpicks, as meatball sliders or over rice for a main meal! Prepare meatballs and sauce as directed. Once meatballs are browned, place in a large crock-pot. Cover with prepared Chipotle Cherry Coke Glaze. Cook on high for 3-4 hours or on low for 6-7 hours. Oh! And don’t forget to check out the National Coke Zero Final Four Selfie contest! 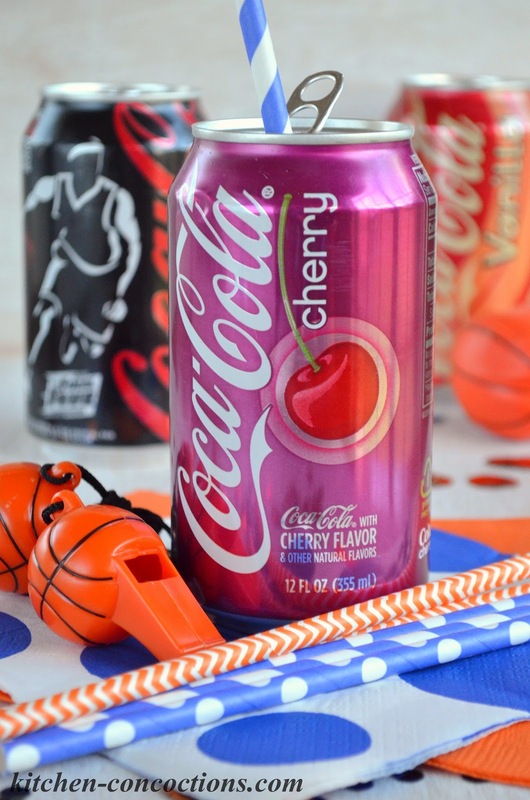 Upload a selfie with a Coca-Cola product on the site below, and be entered to win 2016 NCAA Final Four tickets! Afterwards, you can go on the site to find your selfie and see all of the others!